With Warden Wolfe aware of his secret identity, Barry finds himself on the auction block along with all the other metahuman criminals in Iron Heights Prison when Blacksmith comes to bargain. As Barry debates revealing his powers while leading an escape, a figure from Ralph Dibny's past leaves him wondering just how much he's really changed despite his new gig as a superhero. The Flash: Iron Heights by Geoff Johns and the television series Prison Break. The whole idea of sending Ralph in to impersonate Wolfe with his fledgling shape-shifting powers seems incredibly ill-advised. Particularly when Ralph was able to successfully break into Iron Heights Prison once before and it would be a heck of a lot easier to plot an escape plan with a stretchy private-investigator with contacts on the inside than to use him as a face-man to con another criminal, leaving Team Flash with the original problem of having to arrange a prison break. Blacksmith recovers from the knockout gas in record time. Despite Killer Frost's pep-talk, Ralph doesn't show up for the prison rescue. Wouldn't somebody notice that Barry Allen is back in his old cell after being moved? It seems unlikely that the CCPD DA's office wouldn't demand that "DeVoe" submit to immediate DNA scans to prove his identity, given then have just as many prior experiences with metahumans who could shape-shift. (Everyman from 119, for instance) as they do people who showed up alive after seeming to be dead. Then again, Barry should have been able to prove his innocence given that his body should have been free of any wounds corresponding to the DNA that was supposedly found under DeVoe's fingernails from where he gouged his attacker during a struggle. Richard Brooks seems to be having a fun time as Ralph disguised as Warden Wolfe. The scene between Danielle Panabaker and Harley Sawyer as Killer Frost gives Ralph a pep talk is the high point of the episode. The final scene of Sugar Lyn Beard as The Thinker, dancing with The Mechanic, is just plain creepy and a great turn for the Hazard actress. The character of Warden Gregory Wolfe first appeared in The Flash: Iron Heights special from August 2001. Driven by a near-psychotic hatred of the criminals he was tasked with guarding, Wolfe's tactics were loathed by the CCPD and The Flash, but tolerated because Wolfe proved to be the only warden capable of containing most of The Rogues placed under his control. 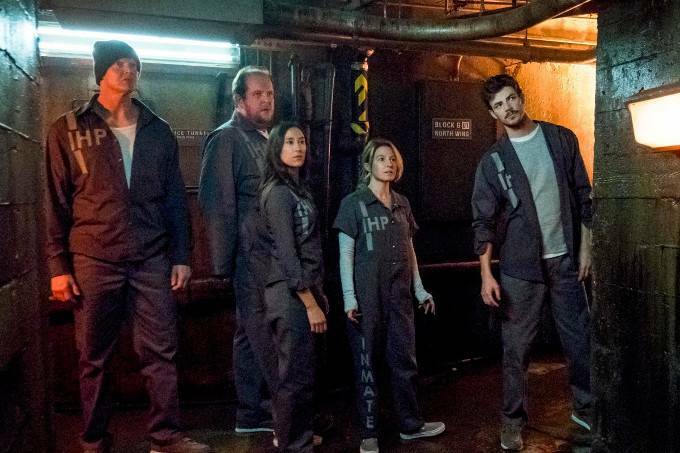 Even so, The Flash stepped in when he discovered Wolfe actively torturing metahuman inmates, such as forcing the radioactive Fallout (who turned himself in to face manslaughter charges after accidentally killing his family) to serve as a living nuclear reactor to power the Iron Heights facility. The comic book version of Warden Wolfe was a metahuman himself, possessing a power to initiate painful muscle spasms that could incapacitate even the most powerful of metahumans. He could also use his powers to force muscles to relax. The DCTVU version of Warden Wolfe has been revealed to be as corrupt as his comic book counterpart. Rather than being a fascist who abuses his authority, however, the TV version of Warden Wolfe is a crooked cop willing to make bargains with criminals like Blacksmith to profit himself. Ralph Dibny is able to smell Earl Cox long before he gets to his office. While it is possible that Earl Cox has particularly foul body-odor, Ralph Dibny's powers in the comics include an enhanced sense of smell even before he stretches his nose. While Ralph Dibny had some shape-shifting powers in the classic Silver Age Flash comics, these were limited to reshaping his face by stretching certain features and reshaping his body to look fatter, more muscular or taller. He disliked doing this, however, because it hurt to force a shape for too long and he couldn't hold fine details long enough to maintain a deep cover. It also proved ineffective for quick disguises since he was unable to change his skin tone or hair-color. The New 52 version of Ralph Dibny from Secret Six had full shape-shifting powers, being a natural wiry redhead who transformed into a muscular brunette when he adopted the persona of Big Shot. Ralph's difficulties in walking after successfully shifting shapes seem to be a nod to the difficulties the Silver Age Elongated Man had with disguising himself. Ralph orders a Gingold on the rocks while undercover as Wolfe. This is the soda from which Ralph extracted the formula that gave him his stretching powers in the classic comics. The ventromedial prefrontal cortex is the part of the brain where beliefs and doubts are formed. Hazard recognizes that Barry has a fracture of either the fourth of fifth metacarpal from when he injured his hand punching a technician. Joe: Wolfe is trafficking metahumans? Is everybody crooked in this town? Cisco: He always did look smug in those Italian wool suits. (pauses) Oh my God! He's literally a Wolfe in sheep's clothing! The Mechanic: Wolfe and Amunet's latest criminal undertaking throws an annoying wrench in our plans. What shall we do? The Thinker: I don't know. The Mechanic: (slowly turning to him) You... you don't know? The Thinker: My mind is consumed by a near infinite web of variables, more plentiful than there are atoms in an exploding star. (smiling) So, for the moment, I do not know. The Mechanic: I fail to see the humor in this. The Thinker: I heard that. In your mind - a flash of stimuli racing through your ventromedial prefrontal cortex, where belief is formed. And doubt. The Mechanic: (testily) I don't have any doubt. And if you had asked instead of reading my mind then you would know. The Thinker: I do know. As for your earlier inquiry, it's not about what we are going to do. It's about what Barry Allen is going to do. Ralph: Wow! Sweet chiseled cheekbones! I did it! Wow! Maybe I can save Barry! Ralph: Uh - little help? Caitlin: (To Cisco) Next we need to work on his motor skills. Dwarfstar: Oh! My bad, Tiny. Hey, soon as we get out, I'll steal you a brand new pair of Timmy Choos. Hazard: It's Jimmy. I'm a size 6. You're so sweet. Black Bison: If you want to use your powers for something useful, you could help me steal back some native artifacts. Barry: If you two plan on going back to crime, you might as well just turn around. The Flash will just run you back here. Same goes for all of you. Kilgore: Don't look at me. I'm reformed. From now on, I only commit legal crimes. Hazard: I don't know. Using my powers just hurt those around me. My good luck just jinxed everyone else. (thoughtfully) You know, you seem to really care about people. Not like the type of person who'd... take someone's life. Barry: I didn't kill that teacher. I wouldn't take a life. You know, not every meta uses their powers to hurt people. Some use them to help others. To protect people. Our powers don't decide who we are. We do. Killer Frost: So you screwed up? Get over it! Ralph: You are a mean lady! Killer Frost: I'm just telling you what you need to hear. Ralph: Yeah, well I'm not going to miss you when you leave. Killer Frost: Leave? Is that what this is about? Ralph: Well, yeah. Everybody leaves Ralph Dibny eventually. That's how this whole thing works. I screw up big time and, tch, they take off. (Ralph collapses on his couch.) This time, the people who are going to leave are actually my friends. Ralph: They're the first ones that I've had in a real long time. Ralph: Yeah, well I wouldn't expect you to understand. You kidnap and stab all your friends. Killer Frost: Right! I'm the queen of letting these people down. But you know what? They're still here. No matter how much I disappoint them, they still show up for me. I don't really understand it, but I think that's part of this whole friends thing. So, unless you do something worse than kidnap and stab them, I think you're going to be just fine. Ralph: You really think so? Killer Frost: Yes. I do. Ralph: Huh. You know... that actually wasn't a bad pep talk. Killer Frost: Well, it's your turn next time. If I ever decide to go full villain again, you can give me the lame heart-to-heart. Blacksmith: Step aside, boys. Mommy needs to work. Blacksmith: Oh, you have got to be kidding me. Warden Wolfe has a secret ward for metahumans built on the ruins of the first Iron Heights, completely camera-free and off the books. Blacksmith last appeared in an active capacity 409, though she appeared briefly in the stinger at the end of 412 talking to Warden Wolfe. Kilgore is seen for first time since 402. Hazard is seen for the first time since 403. Black Bison is seen for the first time since 406. Earl Cox has a distinctive odor of Drakkar Noir, onions and liverwurst. Harry Wells is absent in this episode, having gone to Earth Two to check on his daughter, Jesse. Ralph is discovered to have the ability to use his powers to shape-shift, after he accidentally changes into an exact replica of Earl Cox while describing him to the rest of Team Flash. Cisco says that it took him some time to learn how to clear his thoughts to use his Vibe powers and that Ralph should clear his head before trying to shape-shift. The DeVoe's song is "Going Out Of My Head", first recorded by Little Anthony and the Imperials in 1964. It was the first song they danced to shortly before their first kiss on June 27, 1997 at 8:13 pm in the countryside in the small hamlet of Boar's Hill. It was also the evening The Mechanic realized she wanted to spend the rest of her life with The Thinker. The Thinker's telepathy has difficulty reading The Mechanic's mind when she is thinking of music. Dwarfstar, Kilgore, Black Bison and Hazard now know that Barry Allen is The Flash. The Thinker's new and improved chair generates a metahuman power negation field and can teleport. The Thinker kills Dwarfstar, Kilgore and Black Bison after absorbing their powers. He then projects his mind into Hazard's body. The Thinker kills Warden Wolfe. Barry's calendar shows that he has been in prison for 19 days. Ralph impersonates DeVoe in court, claiming that he just woke up in his home alive and well but that he remembered someone stabbing him and saying something about a frame job before he passed out. Barry notes that DeVoe only killed the bus metas when he could have gone after The Top, Weather Wizard, Peek-a-boo or any of the other metas in Iron Heights. The Thinker uses the tears of The Weeper to drug The Mechanic and put her in a romantic mood when he can't read her thoughts following her objections to Warden Wolfe's death. A profoundly stupid episode that rushes to restore the status quo of the series. A few golden moments work (the Killer Frost/Ralph scene, Hazard making the decision to be a hero, the creepy final scene with The Thinker in his new body with The Mechanic) but ultimately so much of the episode is pointless filler up until the last 10 minutes amazingly restore everything back to the way they were four episodes ago. It does manage to make you feel really bad for Hazard, however, so it accomplishes that much. But Blacksmith manages another miraculous, nonsensical escape, Warden Wolfe - one of the best villains in the comics - is killed off for no good reason and everyone continues to treat Ralph like the red-haired step-child of the team when positive reinforcement has been the only thing that's helped him improve.